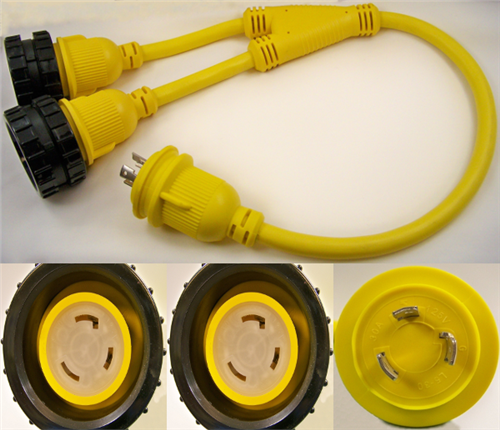 High Tide Marine Cords presents our heavy duty 30 Amp "Y" Adaptor. This adaptor splits a single 30 Amp source into two 30 Amp sources. 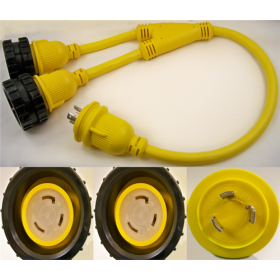 Features include: Heavy Duty 10/3 Gauge Wire Bright Yellow Color for Improved Visibility 36 in (3 feet) inch overall length Adjustable Sealine Collars to ensure a Watertight Seal LED Indicators at all plugs and receptacles. The LEDs let you know when the power is connected! All High Tide Marine Cords products are of exceptional quality, allowing you to purchase with confidence. High Tide Marine Power Cords to fit just about any need in the marine industry. All are made using non-marring Yellow or White PVC material and are all guaranteed to be 100% water tight. Each cord is rigorously tested to U/L and CSA standards under fresh as well as salt water conditions. They are also RoHS Compliant. Ordered this on a Tuesday, received on Thursday, and used all that weekend. Very happy with my purchase. Thank you, I will be ordering from you in the future. Great quality product for less than 1/2 the price. Great buying experi nice as well. The product was great quality and extremely good value. It shipped within two days of ordering it and we received it within the week. Excellent service and quality all the way around! "Fast shipping, good service, great prices, thanks"
"Great prices, fantastic service and super fast delivery. I wish I had tried Boaters Plus much..."
Price (very competitive); E commerce..."
"Found your business while checking on line for sound insulation for a motor box cover - Found a..."
"item received was as advertised...shipping was fast...."